THe best narratives, at this point, are witnesses and survivor observations with pictures. The worst I’ve seen and heard at this point tells about several motorists stranded between fires on either side of the road. As the fire approached, they huddled together and died in that way. I get chill bumps writing it. The fire is not contained. I’ll try to find useful links. Not exactly in unison with statistics I found elsewhere, but some facts. ATHENS — Fast-moving wildfires near Athens have killed at least 49 people, officials said on Tuesday, and have forced thousands of tourists and residents to flee in cars and buses, on foot, and even aboard rickety boats and makeshift rafts. Gale-force winds topping 50 miles an hour have fanned a pair of fires that tore through seaside areas popular with travelers, injuring at least 172 people — including 16 children — and leaving behind a trail of charred resorts, burned-out cars and smoldering farms. Many evacuation routes were blocked, and people who did manage to escape by road had to drive through choking smoke, sometimes with walls of flame leaping through trees just yards away. Greece’s emergency services were stretched to capacity, as more than 600 firefighters and 250 fire engines were deployed to the sites of the two largest fires, in and around Rafina, about 15 miles east of Athens, and Kineta, about 30 miles west of the capital. In a 24-hour period ending Tuesday morning, 47 new fires broke out, though all but four were quickly extinguished, said Stavroula Maliri, a spokeswoman for the national fire service. Government officials and others speculated that at least some of the fires had been set deliberately. Certainly the fires in Greece. especially that one in the resort town of Mati are the worst fires on the southern Peloponnese peninsula since August 2007. And it's more than sad that this inferno killed more than 60 persons. Fortunately, the wind calmed today so the fires can get (hopefully) controlled. Just noting here that of more than 30 wildfires in Sweden, several are not yet under control and four cannot be put out without a radical weather change. These fires are the biggest Sweden has seen since more than a century. The average annual area burned by fire over the past 20 years in Sweden has been roughly 1,900 hectares. The 2018 fires surpassed 30,000 hectares last week, one of them on its own bigger than the 2014 fire ( a single forest fire of 13,800 hectares). The European Forest Fire Information System's website gives a lot of information here in Europe (resp. the EU). I never see news about Sweden. Thank you. I’m interested in what’s happening everywhere. I never see news about Sweden. A total fire ban has been enforced in several counties across Sweden since yesterday. Some hundred German firefighters and hundreds more from other European countries support their Swedish colleagues. Fortunately, the total number of wildfires wreaking havoc across Sweden's forests and countryside has dropped from around 80 last week to 21 this Tuesday. Meanwhile in Finland's northernmost Lapland province, fires have ravaged woods and grassland close to the border with Russia. Norway, which experienced its hottest May temperatures on record, has also seen several small fires, and one firefighter was killed on July 15th trying to contain a blaze. Fires have raged for five days in Latvia, destroying more than 800 hectares in the Baltic state's western regions. Greece's worst fire disaster since 2007 has killed at least 74 people. 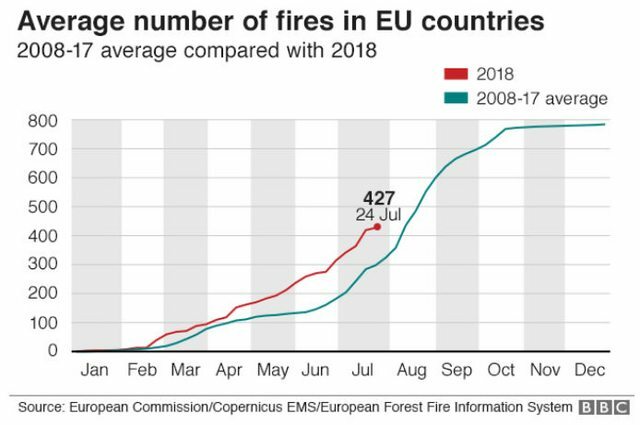 EU countries Spain, France, Germany, Italy, Portugal, Lithuania, Denmark, Poland and Austria have also responded to calls for help from Sweden, which was battling 21 active fires nationwide. So far they have sent nearly 1000 firefighters, 100 vehicles, seven Canadair planes and seven helicopters. Here, in my state, the risk level for fires for today and tomorrow is on the second highest level, one third of the state on the highest. But, very importantly, the area they burned is only about half what is usually seen - 55,700 hectares, compared with 112,000 hectares. In the UK the area burned so far - 13,888 hectares - is more than four times the average of the past decade. The fires have included an area of peatland near Manchester and grassland in London. In Sweden, the figure, 17,691 hectares, is an astounding 39 times the 10-year average. Dozens of fires have burned from the Arctic Circle down to the Baltic Sea. In contrast, most of the Mediterranean - which usually sees a large number of fires - has had a relatively cool and wet spring and early summer. 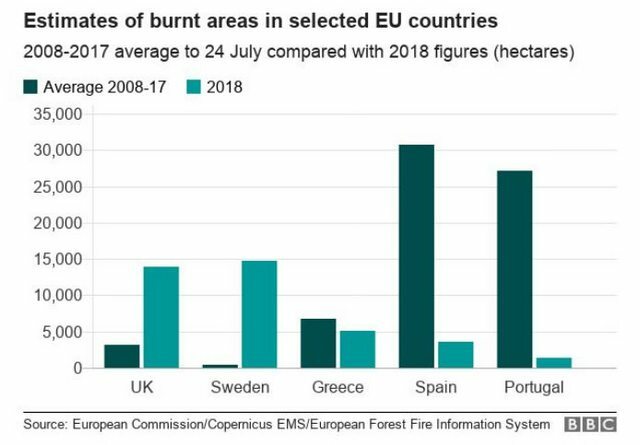 Spain and Portugal, which normally have the largest areas burned of any European countries, have suffered relatively few fires - only 12% and 5% of their average, respectively. Five days after devastating wildfires decimated seaside communities outside Athens, leaving 87 dead and countless missing, Greece’s embattled prime minister Alexis Tsipras has assumed political responsibility for the disaster. At least 91 people have died in the devastating fires in Greece. Another 25 people are still missing, the Greek fire brigade announced. Several bodies have not yet been identified, it was said. The fire department assumed that this would take several more days. Only then will there be clarity about the fate of all those missing. Surprisingly, no other firefighters from Germany had to leave for Sweden on Sunday evening to relieve their comrades. A spokesperson for the Ministry of the Interior of Lower Saxony said that Sweden had decided to reduce the use of international helpers to fight forest fires. The weather forecast promises a relaxation of the situation, it was said. MATI, Greece (Reuters) - Standing in the burnt-out shell of what used to be his home and business, Theodoros Kouris waits for Greek government inspectors to decide the building’s fate. It has been one month since Greece’s deadliest wildfire ravaged the now deserted seaside town of Mati, killing 96 people, and life here is still far from normal. Funeral notices are plastered on electricity poles. The smell of burned pine still lingers in the air, along with a metallic odor from melted cars and other objects. A few people wander the streets, wearing surgical masks. An inspector spray-paints a red triangle onto Kouris’s wall, declaring the building that was his home and, next to it, his grocery store, unsuitable and set for demolition. Kouris, his wife and their three children now live with relatives in Athens and hope to qualify for relief measures announced by the government, including financial assistance. More than 4,300 people have applied for state aid, the government said on Thursday. Engineers inspecting the area have so far ordered scores of buildings to be demolished. Mati, a heavily wooded area which sits on the coast east of Athens overlooking the sparkling sea, was popular with pensioners and children at summer camps. Now scorched, it resembles a ghost town. “The area has become desolate,” a 50-year-old woman who gave her name as Maria said, as she and her daughter filled bags of wreckage cleared out from a summer home built by her grandfather. “I believe it will take years before we can return to normal circumstances,” she said. Sitting in the blackened yard, Maria’s 85-year-old mother was there to bid farewell to the house in the event it was torn down.